Forest Ranch Charter School maintains a GATE pull-out program for students in second through fifth grade who qualify. These students are encouraged to explore their world and share those experiences with their fellow FRCS students. GATE students dig deeper through History/Science and Cultural mini units. 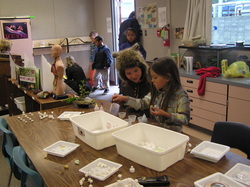 Over the years they have created a Hands on Science lab, held a Norse Feast, explored causes and solutions to eco problems on the planet, delved into the humanities, solved tech. challenges and much more. In 2016 FRCS started an Honors program for students in 6-8th grades. Our Honors Program meets every other week and has ongoing assignments that challenge and enrich our accelerated students. This class is taught by Mrs. Bodney, our Independent Study Coordinator. Students created their own slides. Human skin, donated by Jacob S, was the favorite. 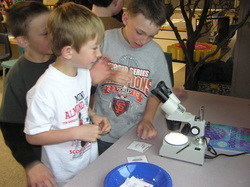 Hosting a hands-on lab of their own, students teach and learn about salt crystals and molecules. Why are the honey bees disappearing? This was the subject of a presentation made by the 2012-13 GATE class at the Endangered Species Fair on May 4, 2013. Download the Enterprise Record article here.